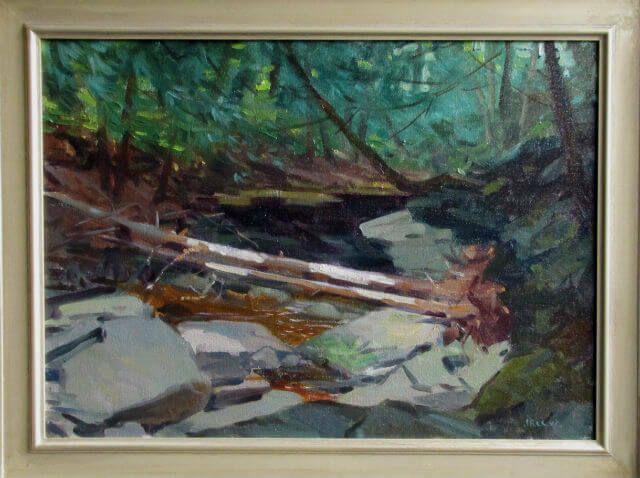 This week on Saturday, December 10th, I will be showing some of my work from the Plattekill Falls Residency program. This was a grant that I received this summer from The Catskill Center for Conservation and Development. 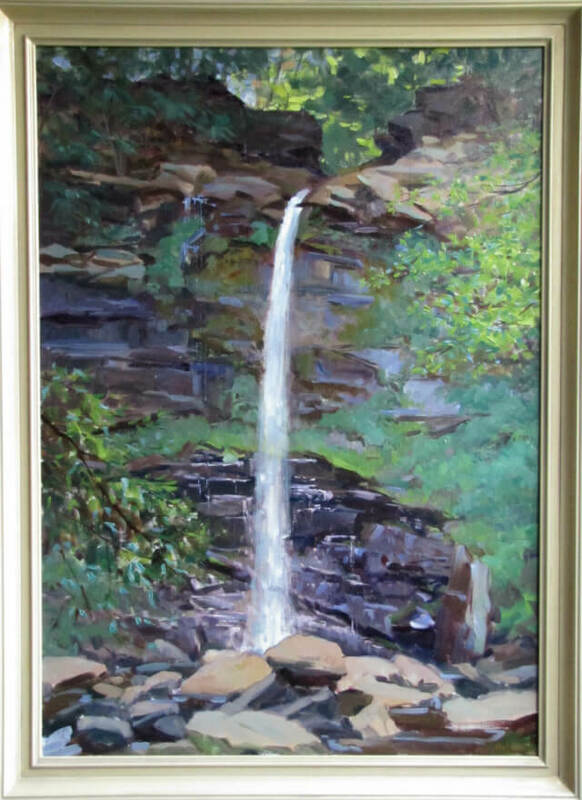 This grant allowed me to paint the Plattekill Falls and the surrounding area of the Hudson River. I was able to stay in a small rustic cabin just above the falls. It was a wonderful time of rigorous painting and contemplation. Along with painting, I spent time working on compiling this blog in the hopes of creating a more complete expression of my ideas which I hope at some point to publish. I am only at the very beginning of this project but the residency gave me that moment of pause so necessary to creativity. It is in these pauses, these moments of intense recollection that one finds the source of one’s imaginative powers. These pauses are great gifts and from such a gift , the artist is able to return a gift by offering these moments back to the world, back to society. The observations, both interior and exterior, become the jewel held out by the artist for others to see and to hold themselves. It is in these small observations, these material moments of reverie that insight comes not only to the artist himself but to those that further contemplate these images. I love how Manet would spend so much time composing his letters to family, friends and even clients and gallery owners. He would always begin by drawing something very ordinary that was before him- a peach, a flower, a chestnut in its case, even a tiny almond just split open- then he would write. I feel these small studies opened Manet up to a space of reverie and deep contemplation and in that interior space he was able to write what was in his heart. This exercise allowed his creativity to manifest itself on two planes- that of a visual acuity seeking to extract meaning from what appears to be ordinary as well as provide an access to his innermost thoughts. These simple expressions of observation became a jewel he could return as a gift to those he wrote to. And the fact that many of these letters have been preserved, they were small about 5″ X 8″, shows how much they touched the readers. So I offer my simple observations back as a gift to those who wish to see and to see again the beauty that lies before each one of us if we only take a pause to see it in its fulness. Thank you for the opportunity, for it is in those that support the arts, we artists find consolation. 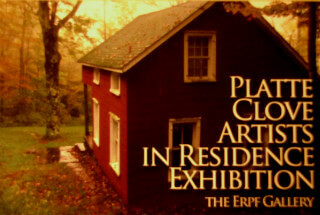 The show runs from Saturday, December 10, 2011 until April 6, 2012. All work is for sale and inquiries should be through The Erpf Gallery at www.catskillcenter.org. ; 1-845-586-2611. The images presented here are on display. 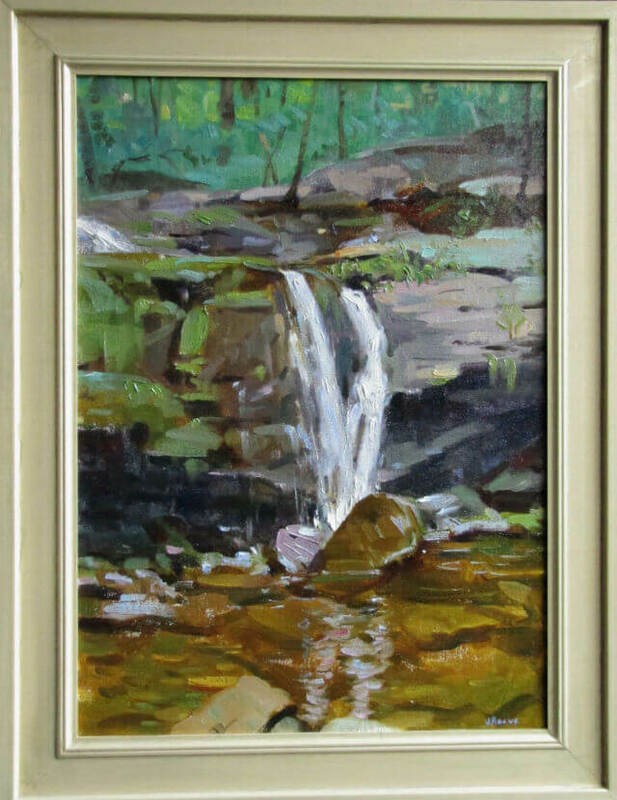 Several images from that week at the falls are not in the show and any inquiries for further images should contact me at attentiveequations@gmail.com. Wonderful lush paintings with such a great sense of being there. In the one of the falls you really give the felling of the size and depth of the space. Beautiful paintings!